Have you ever used the NNTP service that comes with NT 4.0? and higher? It was part of the Option Pack, and later incorporated into the OS starting with Windows 2000. I’ve always seen people mistakenly install it, but I don’t think anyone ever really used it, as it cannot feed from other servers, and is really all around inept. Then I stumbled onto this post, from 1998, which mentions that you can feed NT’s NNTP with a 3rd party program, and then he gives a simple example written in perl. Now the program hinges on the NEWNEWS command. Although I’m sure with a little perl knowhow it could work with the normal user list commands, as it would then need a database of what messages it has already transferred. 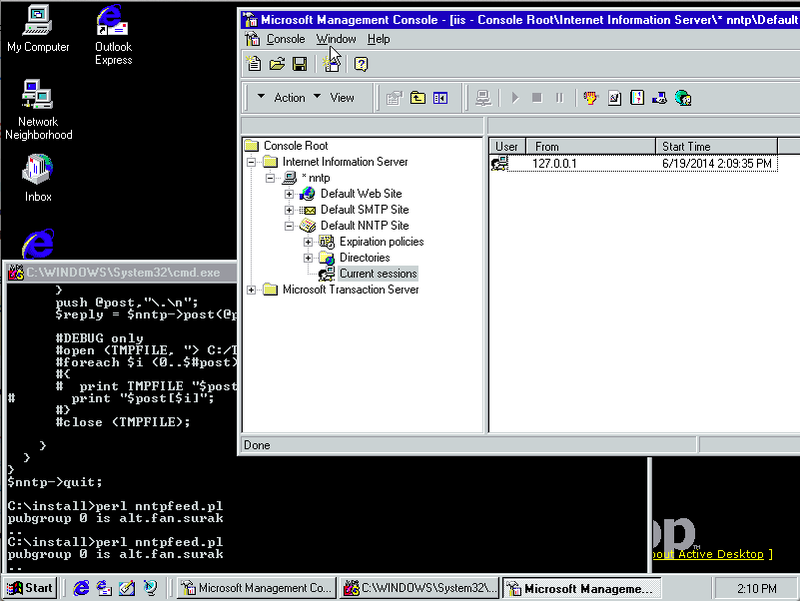 I was interested in taking a peek of MS NNTP in action, so I installed a copy of NT 4.0 in Qemu, redirected port 119 (which needs elevated privileges). The next thing you need is a news server. Once upon a time netnews was a feature of your ISP, and they would keep local news servers to reduce network loads. But times have changed, and now Netflix and it’s cache boxes are the bandwidth kings, as people want to turn the internet into VOD. But whatever. Finding a news service requires some googling around, and the one I found that is the best deal (free), text groups only (yay! ), and it’s online stores go back at least four years is Eternal September. Another contender is Aioe, which doesn’t require a user id. Since I’m going with eternal september, I had to create a userid, get the password in the mail, and then I was able to do a group listing. This lets me know if there was an error connecting to the servers, and of course inserting in the username/password. Since we don’t have the newnews command at hand (I don’t see how to pay for it either..) I just did a simple one line change to grab a whole group. Obviously you wouldn’t set this up on cron. #Uncomment line 2 for an initial feed… after this, run as an “At” job every 24 hrs. But if my perl-fu was stronger I’d whip it up, but I suspect it wouldn’t be too hard to have the script maintain what is the last message it’s posted to NT. Next create the groups on the NT side, and we are ready to run. I foolishly tried a massive (well it seemed big) group comp.os.linux.advocacy, and after some 10,000 posts I just aborted it, and set the script to manually updates groups of my choice. I remembered an ancient article about writing socket software on Windows, and the small group alt.fan.surak, which I figured would make a better test. There is only one article and it’s spam, but what can you expect.. The next step was to run perl directly from NT. And to make this difficult, not only do I need an obsolete version of perl, but I need one with the optional network modules, specifically Net::NNTP. This took a bit longer to find, but thankfully Jeffery Baker kept his build around! There really wasn’t an install program, but rather adding the perl.exe into the path. And it works, too! So there we go, after all these years, 100’s of option pack installs later, and I’ve finally used it. Author neozeedPosted on June 19, 2014 Categories nntp, Windows NT 4.0Leave a comment on Have you ever used the NNTP service that comes with NT 4.0? Old Usenet! Party like it’s 1981! Check out this amazing site, olduse.net! It’s really amazing! What Joey Hess has done, is get a copy of the old USENET archives from the UofT, and parse out all the dates, set them in the right format for a news server, then stream them in ‘real time’ as it was, back in 1981. That is right, it’s August 6th 1981. Star Trek II still hasn’t happened yet, can you wait for the hype and the build up for the biggest geek movie since.. well when everyone found out last year (1980) that Vader was Luke’s father? 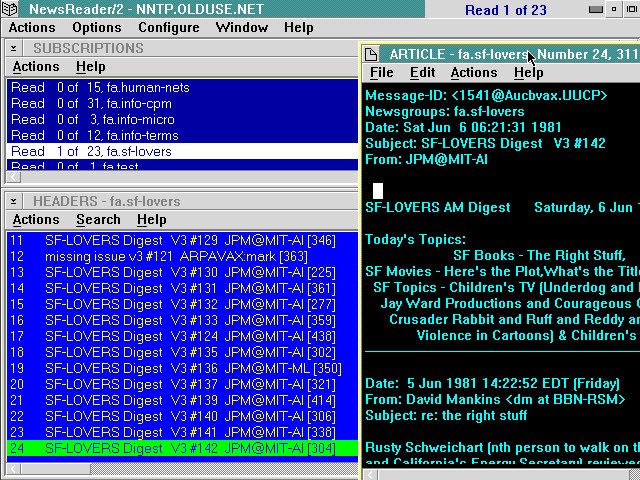 What is also cool is that you can take any news reader (even News/2) and point it to nntp.olduse.net and read away! And not to mention the incredible setup with a telehack like interface to a news reader. Oh and here is a timeline of things to look forward to. But I guess being a ‘time traveler’ kind of takes the fun out of it. Author neozeedPosted on June 6, 2011 June 6, 2011 Categories nntp, random updatesLeave a comment on Old Usenet! Party like it’s 1981! So while browsing around k7tty, I came across this file, internet.zip, that pretty much has everything you need for a windows 3.1 machine to get into the internet using Trumpet Winsock. I used a packet driver, along with Qemu’s built in ne2000 and it works pretty well! A friend of mine let me know that there is a current drive by former users of trumpet winsock to actually send the author the $25 ($35 in adjusted money) that he had asked for the shareware program. While I’ve seen Trumpet, it required a SLIP or PPP connection which I just didn’t have back in 1993/1994 timeline. Sure there was SLiRP, but it was far more involved to compile on the Ultrix machine university gave us access to, or the pay internet connection (sefl.satelnet.org!) that ran IRIX. So I ran Troy Rollo’s Twinsock. Besides being GPL’d twinsock proxied the socket access from your Windows 3.1 computer, and ran the requests on the Unix host you connected to. The best part is that they didn’t have to know that you even ran it. Twinsock transformed the internet from being a Unix shell account that kept many people away, into a graphical experience with windows applications executing on our desktop. Since it wasn’t a real TCP/IP stack, it effectively firewalled us, and seeing we were running Windows 3.1 that was a good thing. This way COM1 on both machines now talk together. The only major downside I’ve seen is that if the client VM is killed re-starting it doesn’t get the serial connection working, both VM’s have to be restarted from the command line. 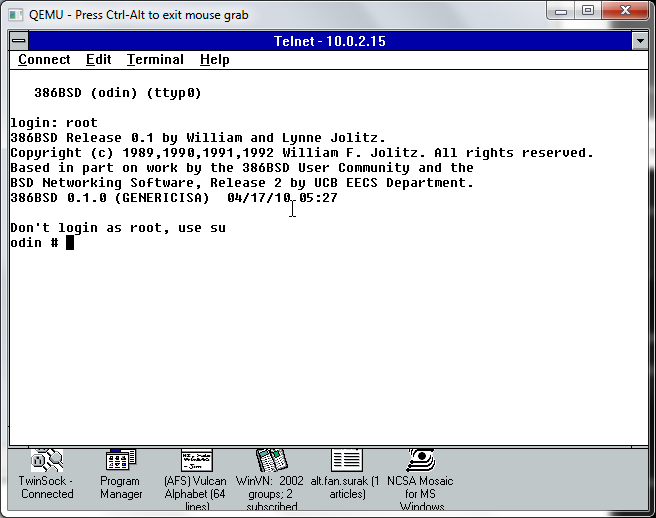 The cool thing was I was able to use a dos terminal program and zmodem to transfer the source to 386BSD to build. Surprisingly this part went pretty smooth on all the versions of Twinsock that I tested, but version 1.3 and higher was the version that actually worked. So with the executable built on the Unix machine, you launch the windows program, which included a minimal terminal program. And from there you can dial up, login to your Unix account, then launch the twinsock Unix component and the window minimizes and now you are ‘connected’. One of the most popular programs & protocols of the “early” internet was NNTP or Net News. 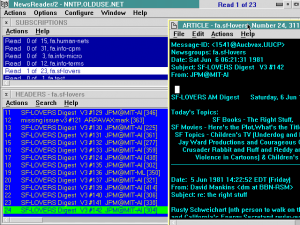 Net News transitioned the world from BBS’s and Forum Software. The topics were incredibly diverse, and the system was distributed by nature. And news traversed the internet in a semiquick fashion. Especially the nodes that had T1 or faster access at the time. Unlike down stream UUCP BBS’s that may only take a small feed once a day, now with Twinsock you could get whatever groups and feeds you wanted, and as fast as your little modem could download it. So for this fun experiment, I downloaded a suitably old version of WinVN, 0.92.1. The first thing I went looking around for was a public NNTP server. A great resource for locating various news servers that have certain groups is newzbot. So with a suitable server in hand, I was able to connect up and check a news group. It was slow and clunky like it was in the old days, but it was neat in that client server feel to know that it was running on my desktop. Naturally it wouldn’t be the internet if you still telneted all over the world for MUD’s, and even access to compilers, different systems, and school work. I had a chore of a time finding a ‘good’ telnet client, so I ended up settling with the one that Microsoft had released their own stack, ‘Wolverine’ as part of a TCP/IP protocol update for Windows for Workgroups. This stack was also significant in that this was the first time a ‘full’ and ‘real’ TCP/IP stack had been released for free. As mentioned above with Trumpet winsock, and the rest, you had to buy the network stack. This free stack was only meant for LAN access, though I’ve heard of people trying to hack PPP/SLIP stuff at the dos level, but again it wouldn’t help me, since I couldn’t SLiRP. But this was the forshadowing of how the internet was going to finally take off, and the short thriving window of 3rd party TCP/IP stacks for Windows was about to slam shut in the next release of Windows. And finally we come the program that basically changed the way we do everything – Mosaic. 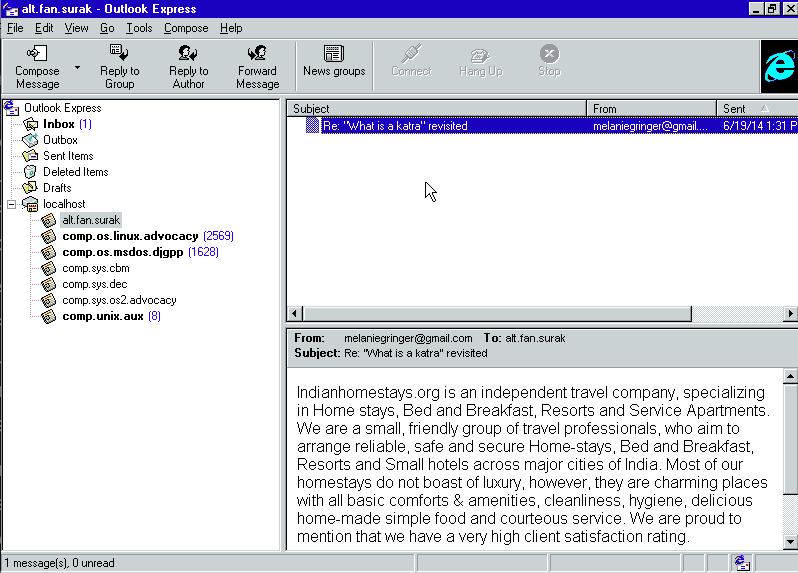 The first web browser only worked on the NeXTSTEP, and I don’t think that Mosaic was the first PC browser, but at the time it certainly was the best. I loaded up an old version to see if it could at least hit a site by IP address, and it worked. Sadly downloading files causes the browser to crash. Mosaic was rather touchy back in the day too. Because Mosaic came from the Unix world of browsers it was a 32bit program, and needed large amounts of memory. It also was a large exe too, around 2MB! Which is far larger then doom & the dos extender! 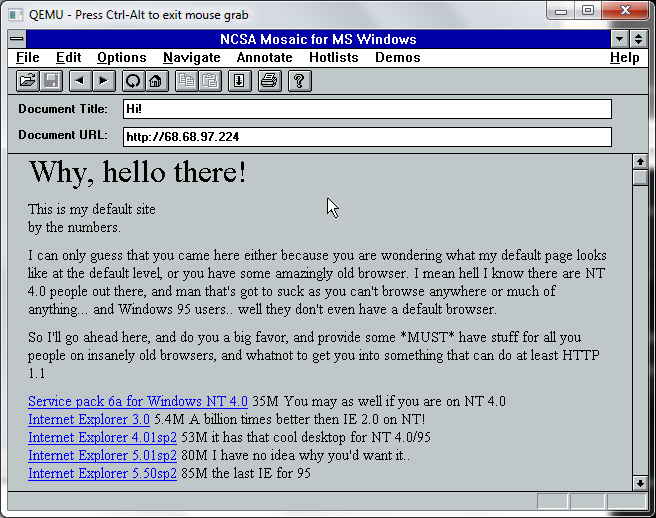 So Mosaic was the first program I can recall that needed the magical Win32s add on. I’ve mentioned Win32s before so I won’t go on and on, but like the TCP/IP from Microsoft, this also basically killed the DOS Extender market. The first time I saw Mosaic, I was blown away, we left the world of terminals and archie/gopher/veronica to something you could use a mouse with, and enter in your own URL! It was amazing, but at the same time I thought the internet was doomed to failure as you had to READ. Oh how wrong I was to be shown later. But in the time between Windows NT 3.1 and Windows 95, there was a lot of reading expected to be done. Much like everyone at the time would reply with RTFM in the news groups for stupid questions, why there even was the “Big Dummies Guide to the Internet“, thankfully made available online, put on various shovelware CD’s and saved thanks to cd.textfiles.com. I couldn’t get MiRC to work.. I forget what other IRC programs would actually work with Twinsock. But I didn’t spend that much time on IRC. Oh well, that is how the internet stood in that pre Windows 95, pre wide scale PPP world. It really was amazing how fast things changed.